Nothing adds more “pop” to your curb appeal than new vinyl siding. A fresh, clean look will make you the envy of every neighbor on the block and you can be sure that the team at West Knox Windows and Siding will get the job done right. Plus, there are other awesome benefits like eliminating all future exterior maintenance, increased energy savings, and added resale value. The combination of a quality product that has been professionally installed will added beauty and style to your home that will last for years to come. Several popular colors and styles available including: shake, board n batten, dutch lap, straight lap, and scalloped. We also specialize in the installation of new vinyl soffit and fascia to give your home a professionally finished touch. We also offer roofing installation in both traditional asphalt dimensional shingles and metal roofing. Many colors to choose from. Replacing the siding on your home is a big decision, but the good news is that at West Knox Windows and Siding, we have the knowledge that you need on your side to make sure the job gets done the right way. 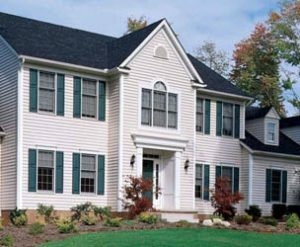 When it comes to vinyl siding installation, you can count on us from the moment you get your free quote to the time that you stand back and admire the beauty of your home thanks to the boost in curb appeal that comes from new vinyl siding.